How to make Greek-containing tokens in minted, without XeTeX or LuaTeX? 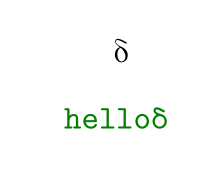 I would like to use mixed Latin/Greek tokens (variable names) like helloδ in minted. To stay compatible with arXiv I cannot use XeTeX or LuaTeX. directly. Any other solutions are welcome too, of course. to force the editor to handle the file in UTF-8. The details are in the TeXShop menu point "Help - File Encodings and TeXShop". Not the answer you're looking for? Browse other questions tagged minted greek or ask your own question.